Viewed from the Shenandoah Valley to the west and the Piedmont of central Virginia to the east, the Blue Ridge Mountains dominate the skyline. It’s along the top of this narrow strip of mountains that Shenandoah National Park is situated, with the Appalachian Trail running down the middle for its entire length. We’ll continue our section-hiking journey by traveling the length of this popular national park, from US 250/I-64 near Waynesboro, VA, in the south, to US 522, just a few miles from Front Royal, VA, in the north, covering a distance of 108 miles. 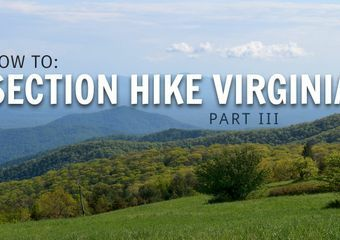 Want to section hike more of Virginia? We’ve got you covered. You can divide this hike into three roughly equidistant sections. 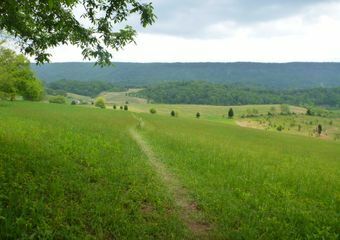 The southernmost section stretches for 45 miles from the southern entrance of the park at Rockfish Gap at I-64, to the entrance station at Swift Run Gap, where US Rt. 33 crosses the park. The next section spans 35 miles between Rt. 33 and Rt. 211 at Thornton Gap. From Thornton Gap, it’s 33 miles to the trailhead on Rt. 522 near Front Royal. This section is distinguished by its lack of significant elevation changes. The vast bulk of your hiking will be between 3,000 to 4,000 feet as the trail winds its way from one side of the Blue Ridge to another, alternating views of the Shenandoah Valley to the west with those of the Virginia Piedmont to the east. Experienced hikers can make good time in this section, and it’s also a fine place for a novice to give backpacking a try. Perhaps the most notable feature of the hike itself is the proximity of the trail to Skyline Drive and the many services to be found in Shenandoah National Park. Because of this, it’s not unusual to have a peaceful moment in the woods interrupted by the roar of motorcycles passing by only a few yards away—hardly a pristine wilderness experience. This negative is offset by the ease of resupply and your many opportunities to sit down for a meal if you choose. 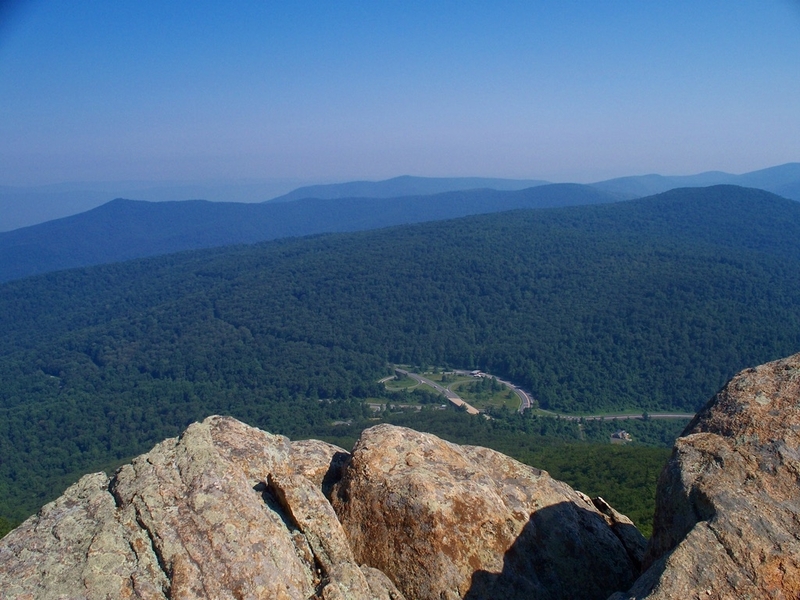 Virtually all of this hike is in Shenandoah National Park. While SNP doesn’t have the same restrictions and permit requirements of Great Smoky Mountains National Park, it does have its own rules. Here are the things to do and don’t do while you traverse Shenandoah. You can read more and check out all the rules right here. Get a backcountry permit. SNP requires a free backcountry permit if you’re going to camp. Even if you’re anticipating staying in shelters during your traverse, get the permit. You’ll find self-serve permit stations on the trail at the northern and southern entrances to the park, and at all of the road entrance stations. Fill out the permit and attach it to your pack. Heed no camping” signs. While dispersed camping is allowed along the trail, you’ll see no camping notices frequently as you near road crossings and park facilities. 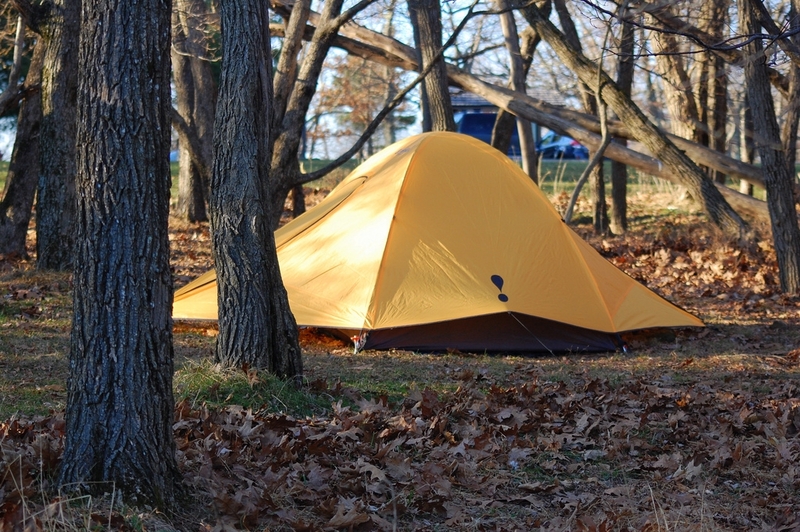 Observe the backcountry camping rules and be a responsible user of the park’s resources. Don’t build campfires. Campfires aren’t permitted in the backcountry with the exception of the firepits and fireplaces you’ll find at the shelters (called huts in SNP). Bear bag! Shenandoah has a very large population of black bears. You’ll find bear poles and bear boxes at all the huts. Save a bear—use them, please. Shenandoah is a popular destination during the spring and summer, but particularly in the fall, when motorists and day hikers take advantage of mostly dry days and cool mountain temperatures to enjoy the fall foliage. If you’re backpacking in the spring you’ll encounter some thru-hiker traffic, but you’ll also enjoy wide vistas before the trees leaf out. Logistically, a complete hike of this section works best as a north to south trip. There’s plenty of parking at the southern end, and a number of shuttle services are based out of the nearby town of Waynesboro. I’ve had a good experience working with Stanimal’s shuttle service, based out of Waynesboro. The AT crosses Skyline Drive over 30 times during this section, often with convenient parking areas nearby. That makes it easy to split this hike up into any number of short segments, particularly useful if you live within driving distance of SNP. And if you’re hiking with a buddy or group, you can simply position cars at each end of your hike—no shuttle required (don’t forget you’ll need to pay the entrance fee for a park pass if you drive on Skyline Drive). Planning is easy—I’ve used the AWOL AT Guide on numerous occasions to map out short jaunts along this section. 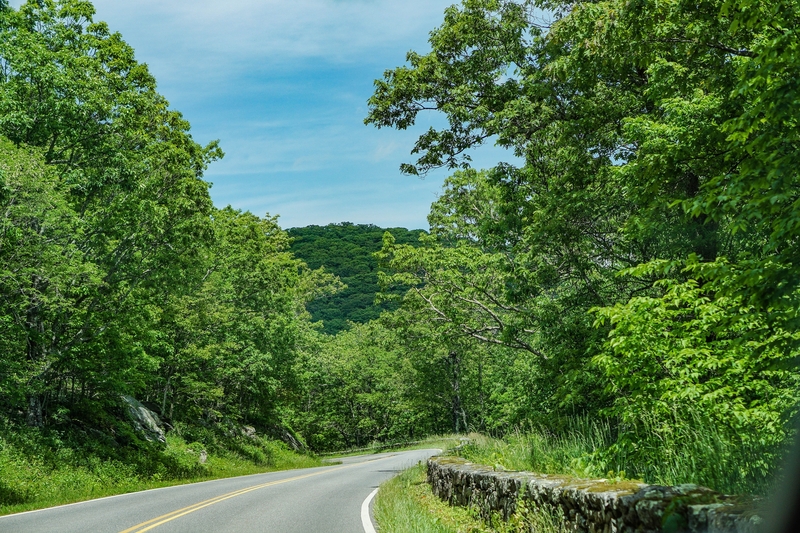 Shenandoah offers some choice views to go along with its gentle terrain. Here are some of the highlights (distances measured north to south from US 522). Marys Rock is located about 1/10 of a mile off of the trail just south of the US 211 entrance station. If you’re coming from the north it’s at the end of one of the longer climbs you’ll find on the AT in SNP, so it’s a perfect spot to stop for a breather. You’ll enjoy an excellent view of Massanutten Mountain to the west. The rocky summit of Stony Man is about 3/10 of a mile off the AT, via a well-used side trail. 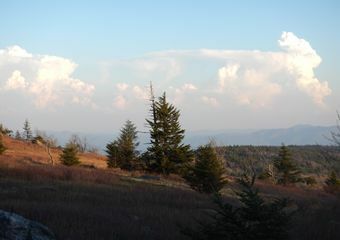 It’s near the highest elevation the AT crosses in SNP and offers expansive views to the west. Take a few moments to bask in the sun and watch vultures and raptors soar along the ridge. A jumbled heap of talus blocks, Blackrock is a popular day hiking destination in SNP. A quick rock scramble will take you off the trail and to the top—a great location for a trail selfie. Previously accessible via a side trail, the AT was rerouted several years ago to go over this small, grassy bald. You’ll enjoy views of the mountains to the south and north, and find several nice campsites in the shelter of the hill to the north. A great spot to stop for lunch or for the night. Campsite at Loft Mountain Campground. Shenandoah is unique in the number of services you’ll find along the trail. Unlike sections of the AT to the south in VA where you need to plan for four to five days without resupply, you’ll experience an abundance of opportunities for short-term resupply and dining without having to stray very far from the treadway. Going north to south, here are the highlights (distances measured from US 522). Be sure to check the SNP website for current facility hours. Right on the trail at a Skyline Drive crossing, Elkwallow features a grill and some limited groceries and snacks. The adjacent picnic area is a fine place for a break. Skyland is a major destination in Shenandoah National Park. A full-service restaurant, tap room, and snacks are available. If you’re looking for a night off the trail, you can book a room at the resort, though make a reservation before your trip. Another major destination in SNP. Big Meadows features a campground abutting the trail, rooms at the lodge, and a camp store with a small restaurant. While the camp store caters more to car campers, it’s a good resupply option. There are numerous side trails in the Big Meadows area—be sure to check your guidebook or app to find the facilities you need. Lewis Mountain Campground offers campsites and cabins, plus a small camp store. The AT skirts the Loft Mountain Campground, with a side trail that leads to a well-stocked camp store with showers. The Frazier Discovery Trail just to the north of the campground leads to the Loft Mountain Wayside, which has a short-order grill and small store with snacks. Our series on section hiking Virginia will conclude as we cover the distance between Front Royal and Harpers Ferry. It’s a short section, but not without some notable highlights and a few tough stretches, finishing in one of the iconic trail towns along the AT. Nice article! There are plenty of places to park all along the way that facilitate easy AT section hiking and blue blazing the over 500 miles of trail in the park to beautiful waterfalls and views. I recently completed sectioning this park on my AT journey and it is very enjoyable! Note however, in the winter (Mid November until March) the trail might as well be the “other 100 mile wilderness”. There are no resupply points in the park in the winter.